Philippine telco and digital services provider PLDT has announced the TVolution streaming box, developed in conjunction with Roku. Leading US operator Altice USA is eyeing adding content from various streaming video companies. Massive Interactive has unveiled a major update to AXIS, its video merchandising platform, offering operators the ability to package, present and monetise video assets in real-time across any device. Leading Australian telco Telstra is to become one of the first operators to virtualise media processing functions as micro services and centrally orchestrate media operation flow through cloud infrastructure. Wowza Media Systems and Haivision have founded the SRT Alliance, to manage the open-source availability of SRT, a video transport protocol. Turner has selected TiVo as its EMEA metadata distribution partner and will utilise services from the latter’s new Studio, Broadcast and Network Metadata Packages to manage its electronic programme guide (EPG) metadata distribution and service, which covers 44 channels in the region. Japan’s public broadcaster NHK has combined forces with Japanese broadcast technology developer Village-Island to transport 8K 4:2:2 60p 10bits on a single 12G-SDI cable. Spanish satellite operator Hispasat has reached an agreement with Telefónica’s broadcasting solutions unit, TSA, to distribute AMC Networks International channels in Spain and Portugal. Ericsson is implementing a new end-to-end primary HD distribution system for Mexico’s leading broadcaster and content provider Televisa. Following recent success in Europe, Asia, Latin America and the Middle East, video-on-demand (VOD) service builder, curator and management firm Grey Juice Lab is now looking to the US with the opening of a new office in Los Angeles. Bidding to help filmmakers and video producers collaborate and streamline video workflows, Adobe has announced a major update for video in its Adobe Creative Cloud solution. Spain’s MediaBank has opened up its platform to sellers of professional video content though cloud-based VSN media asset management (MAM) solutions. Broadcast technology and services provider Ericsson is to unveil new broadcasting solutions it says will streamline control of all processing elements using a micro-services architecture, cutting time to market and offering increased operator flexibility. Cobalt Digital has partnered with Encompass Digital Media on ChannelMark for media enrichment. Malaga-based Tedial’s augmented storage solution has been nominated for the IABM Game Changer Award 2017. 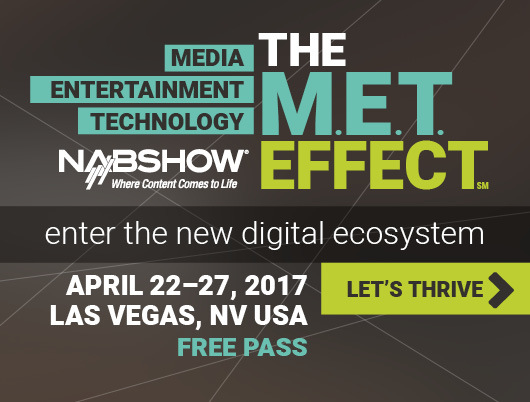 Alticast will showcase solutions to help pay-TV operators address two major shifts – the changing viewing habits of millennials and new technologies that are transforming business models – at the NAB Show 2017. Barely a week prior to NAB 2017, EditShare has announced a binding agreement to acquire Spain-based QC specialist Quales. Imagine Communications is introducing the Selenio Network Processor (SNP), an IP-capable processing solution optimised for handling uncompressed UHD signals for transporting media over IP networks. NASA is planning to produce the first ever live 4K video stream from space, beaming pictures from 250 miles above Earth.